As you all know, I have been against the Bills trying to move up into the top 10 to draft a quarterback. One of the reasons was the cost to get from 21 to say five or six to get that player. With the Bills trading offensive tackle Cordy Glenn to Cincinnati for a swap of number one picks, the cost to move up is not nearly as large. Cordy Glenn was not in the Bills plans, if they couldn’t trade they may well have cut him, so swapping first round picks is a huge win for the Bills. It also gave them more salary cap space in which to acquire free agents later this week. Even though the trade creates another $11.1 Million in dead money, the Bills pick up $3.5 Million in cap space. At this point of the year it’s not about the dead money but rather how much money do the Bills have to spend? The dead money is all on the previous front office as they did a poor job when structuring contracts. With the trade (which won’t be official until Wednesday afternoon), the Bills now have the number 12 pick in the first round as well as the number 22 pick. 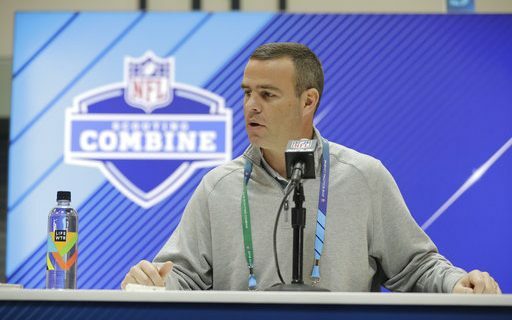 At this time we have no idea who the quarterback is the Bills covet, but we do know that there are four and perhaps five clubs ahead of the Bills with a quarterback need. They are the Browns at numbers one and four, the Giants at number two, the Broncos at five, the Jets at six and perhaps the Dolphins at 11. As of right now, there is a strong possibility that that Giants will pass on taking a quarterback at two. Both the Jets and the Broncos could very well sign a quarterback in free agency. We will know the answer to that by the end of the week and that will also tell us how many quarterbacks could get drafted before the Bills select at 12. To insure that they get the player they want, the Bills have more ammunition to move up than any team in the NFL right now. The Bills hold two picks in each of the first three rounds and each of those picks have value when it comes to a trade up. The 12th pick has a value of 1200 points on the trade chart. For the Bills to get all the way to number two they need to trade the number 12 pick as well as picks equaling a total of 2600 points because that is the value of number two. To do that the Bills would have to give up the number 22 selection (780 points) and both second round picks (730 points total value). The Giants would have to give the Bills something in return to make the trade. It would amount to about a fourth round pick. The Bills may not want to give up all that capitol this year, so they could try and spread the payment out by giving up one of the two’s this year and perhaps a second next year. If that was done then the Bills would not get back a fourth as giving up next year’s pick becomes discounted when it comes to trades. Still that is a lot to give up for what may be the second quarterback drafted this year as Cleveland could very well use the number one pick on a quarterback. For the Bills to get to number three (Indianapolis) it would cost the Bills the number 12 pick plus an additional 1000 points. That would amount to the number 22 pick and the pick just acquired from Cleveland for Tyrod Taylor (number 65). To get to number four (Cleveland), the Bills would need to trade number 12 as well as one of their two’s and the pick just acquired from Cleveland. In all likelihood that would be the most ideal situation but getting to three would just about lock up the ability to get the quarterback they want. 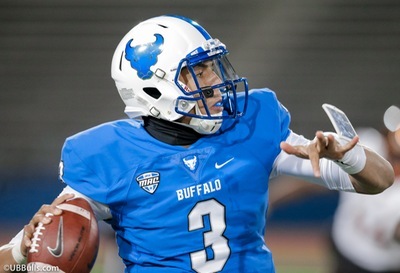 Before any of that happens, the Bills first have to figure out what quarterback they want but the ideal scenario would be that they would want any of two or three, that way they could figure out just high they need to go. What’s nice, is the Cordy Glenn trade just made the idea of moving up a lot cheaper when it comes to giving up assets the Bills have accumulated. The Bills can get inside the top five and still have a number of draft picks to fill other needs. Read Paul Peck’s take on the Glenn Trade, a Double Win.